The Montreal Biodome recreates four ecosystems of the Americas in what used to be the 1976 Olympic Velodome. You walk through the first doorway and are immediately hit with the humidity of the Tropical Forest. There are huge trees and vines, birds, monkeys, giant fish, piranha, frogs, capybara, bats and more. The next doorway brings you to the decidedly cooler Laurentian Forest where an otter streaks up and down it's little stream, a lynx and beavers hide, and a porcupine naps in a tree. In the Saint-Lawrence Marine Eco-system sea birds and many large fish abound. And the Arctic and Antarctic polar areas give us penguins and puffins!!! 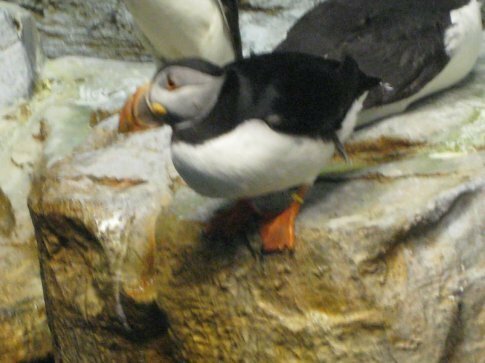 I finally got to see live puffins!!! Cheeky and curious, I can't see why they're not better loved than penguins. The Biodome is one of the best places I've been so far. AHHH!!! Puffin!!! Oh my gosh!!!! !